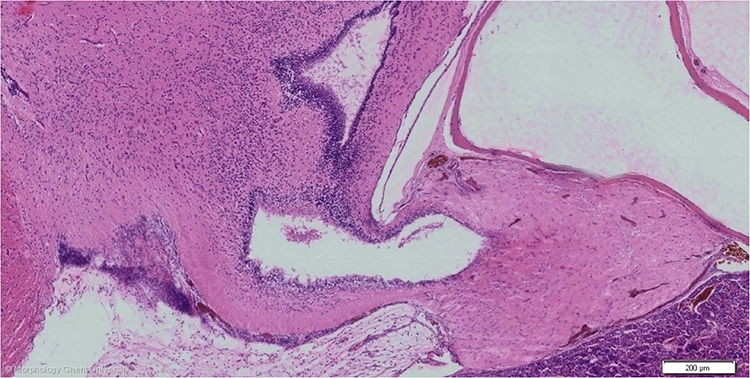 The neurohypophysis consists of a pars nervosa or neural lobe (lobus nervosus), infundibulum and median eminence (eminentia mediana). The avian neurophypophysial hormones are arginine vasotocin (AVT, the avian antidiuretic hormone) and mesotocin (MT, the avian oxytocin). The cell bodies of the neuro-secretory neurons are located in the supra-optic and paraventricular nuclei of the hypothalamus and the hormones are transported by neurosecretory axons of the tractus hypophysius to the median eminence and the lobus posterior where they are released in the capillary network present.